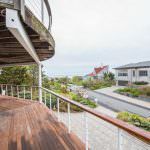 Published on May 23, 2018 in architecture and general info. Closed Tags: Cape Cod luxury sales, Cape cod real estate sales, Provincetown luxury homes, Provincetown new construction, Provincetown real estate. 10 Creek Round Hill Road is a three bedroom three bath home with 2,620 square feet. It is a beautifully maintained contemporary located on a private and desirable West End road, closest as possible to the Moors. It is being marketed for $1.899M. 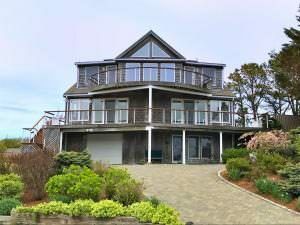 MLS REMARKS : Imagine enjoying expansive views of Cape Cod Bay, the Moors & Herring Cove from this well maintained contemporary located on private, desirable West End road. Upper & main levels feature open design w/ walls of windows & decks, taking full advantage of wonderful water views & magnificent sunsets. 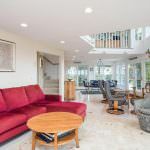 In addition to generous living & dining areas, you will find the updated kitchen, vaulted ceiling, hardwood floors, propane fireplace, & access to side yard, deck and 6-person hot tub. Guest room & full bath are also on this level. Master bedroom suite, comprising the entire top floor, includes large bath, propane fireplace, office & sitting areas, w/ additional deck offering occasional whale sightings. Guest suite w/ full bath is on entry level, along w/ separate laundry area & garage access. Other amenities include oversize one car garage, 6-person hot tub, outdoor shower, whole house security system, professional landscaping, irrigation system with well, split system AC throughout, landscape lighting, water filtration, laundry chute, and mahogany decking. Listing courtesy of Coldwell Banker Pat Shultz Real Estate.